J.K. Rowling spent 3 years as a student at Exeter University in Devon. Whilst a number of places throughout her life influenced the writing of Harry Potter, it is clear that the rolling hills, chocolate box villages, and historical streets of Devon and Exeter were a healthy source of inspiration. Gandy street is a rather charming and interesting street. 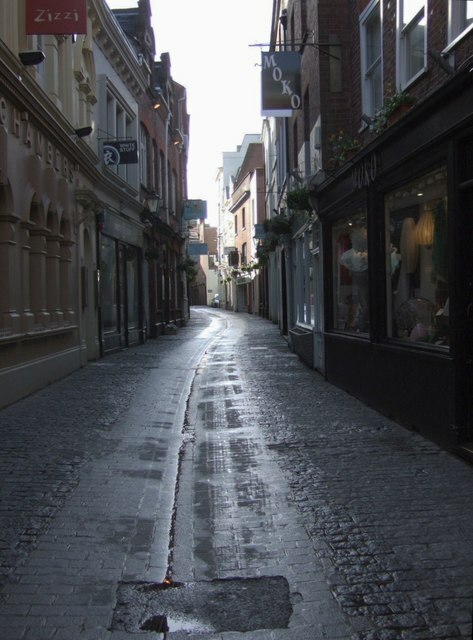 If you ever visit Gandy Street, you will notice its querky narrow passages, cobbled pavement, and the signs hanging outside the shop-fronts. 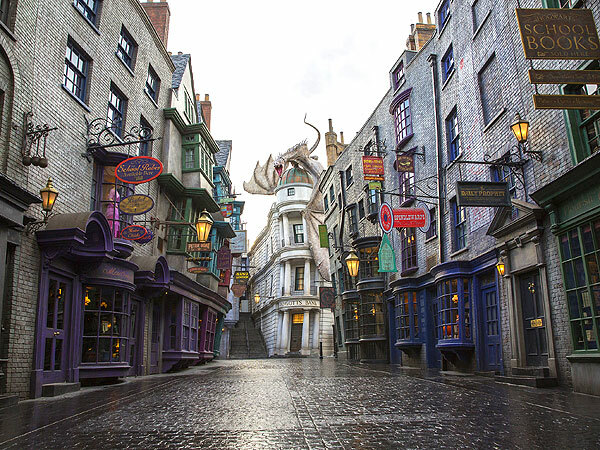 The street is even home to its own Gringotts Bank, in the form of "The Vaults" bar. The resemblance is uncanny. You won't be finding any real dragons in Exeter unfortunately. Mardon Hall, opened in 1933, was the University of Exeter's first student accommodation. 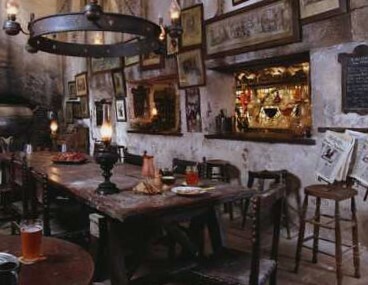 It was the common room which supposedly influenced JK Rowling when writing about the common room of house Gryffindor. In Mardon Hall you can find a wood-panelled library, a large and grand staircase, several large fireplaces, comfy red sofas, detailed red wallpaper adorned with the heraldic crests of Exeter and Plymouth. The colour scheme of the Mardon Hall crest is even red and yellow! You certainly won't be finding any Holland Hall Slytherins here! As an Exeter student, I have frequented The Old Firehouse on many an occasion. Its got great cider, great music and great pizza. The Old Firehouse has a certain character you can't help but notice, and I'm not surprised that this influenced JK when writing about "The Leaky Cauldron". Take a look at the hanging chandeliers, melting candles, musty portraits, wooden panels, and twinkling fairy lights. A pub fit for any wizard I'd say. Update: Muggle sources have confirmed this is in fact false (https://www.devonlive.com/news/devon-news/jk-rowling-harry-potter-exeter-1076267). The Leaky Cauldron from the Harry Potter film series. -Imposing, tall and thin figures with twinkling eyes and white whiskers. -Academic leaders who are renowned for their serenity and gentle wisdom as well as their formidable intellects. -Possessed of whimsical wit and paternal demeanour, commanding reverence and respect from generations of students. Whether or not the link is true, it goes without saying that the knowledge that JK learnt from her degree in classics was fundamental to the creation of Harry Potter. The magical universe of Harry Potter draws from a heavy base of classical mythology. There is also of course Professor Binns! 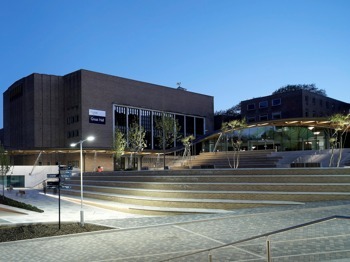 J.K. Rowling has said in person that Hugh Stubbs, another lecturer at her time in Exeter, is the direct inspiration for the character because he used to send students to sleep with his long lectures. This 17th Century secret doorway at 10 Cathedral Close leads into a courtyard. Could this have been the inspiration for the door leading into Room of Requirement? The toilets in the psychology building bear a striking resemblance to Moaning Myrtle's bathroom. According to one student: "It had strange transparent pipes with what appeared to be green slime in them running from floor to ceiling and across the room, for no apparent reason; and this really cool multi-sink unit in the middle." Unfortunately it has since been renovated, so if you're a big green slime fan, you might be disappointed. However the original sink units remain - without a basilisk or a moaning myrtle. "What appears to be less well known is that JK attended a match at St James Park. This was the game against Cambridge United on 21st February 1986. Apparently, according to the local newspaper, it was quite a dour game. The manager at the time was Colin Appleton and we were not a great side that season, finishing in 21st place, in front of ever dwindling crowds. The local newspaper reported that the evening of Friday 21st February was a cold and blustery one. Not conducive to good football. Not that this mattered too much for the Grecians, as the paper reported that the ball spent so much time in the air that they could have dispensed with the pitch! The only moment of excitement, notes the match report, came early in the first half when a passing gull got caught by a hoofed clearance from Exeter City’s Keith Viney. The location of many a gowned Exeter student's graduation. 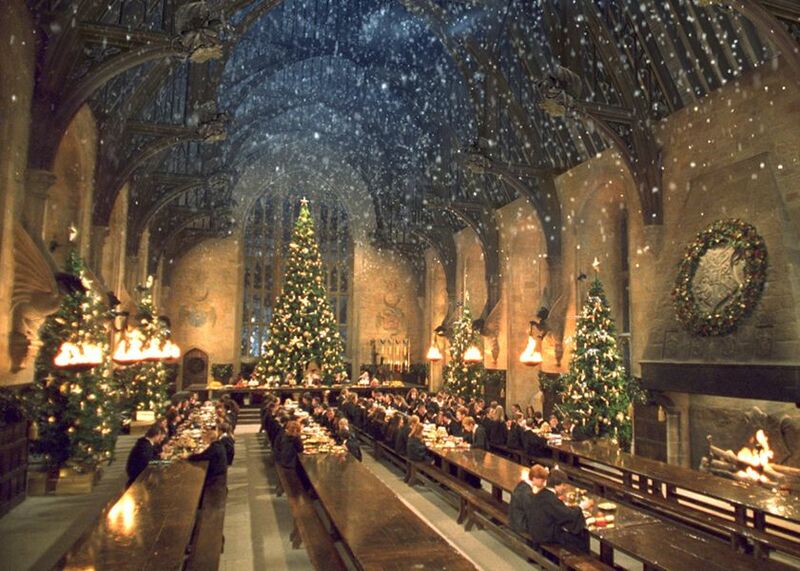 It is likely that the "idea" of the great hall is where Rowling took her inspiration rather than the looks of the Exeter great hall itself. Personally I think the interior of the Cathedral looks rather more like "The Great Hall" in Hogwarts. Exeter Cathedral boasts the longest uninterrupted medieval vaulted ceiling in Europe (96m). The Great Hall seen in the film series. Further into Devon is the the village where Horace Slughorn resided at the time of his meeting with Albus Dumbledore and Harry Potter. It almost certainly gave inspiration to "Budleigh Salterton", a village a few miles from Exeter. The home of the Weasleys, the Fawcetts, the Diggorys, and the Lovegoods. Ottery St Catchpole was probably inspired by Ottery St Mary, a village close to Exeter. The character of John Dawlish - an auror at the Ministry of Magic - probably takes his name from the town of Dawlish on the South Devon coast. Ron Weasley's favourite quidditch team finds its home in the village of Chudleigh, 20 minutes drive from Exeter. In the Goblet of Fire, the sorting hat says "Bold Gryffindor, from wild moor". Perhaps Godric Gryffindor's birthplace, Godric's Hollow, is one of the villages situated in and around Dartmoor. Dartmoor itself is an historic place deep in folklore. Widecombe-in-the-moor is pictured above. If you do ever decide to visit Devon, make sure you keep your inner eye open for traces of wizards and magic. P.S. A true Harry Potter fan in Exeter should probably join the university's own Harry Potter Society!